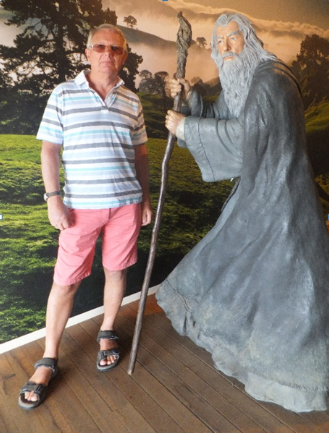 We set off early today as we had a date – with Gandalf! 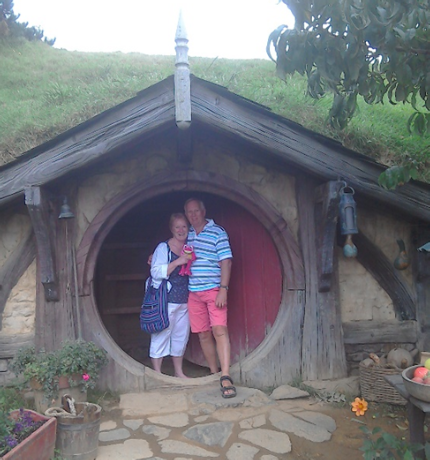 Taking Trip Advisor’s advice, we were booked onto the first visit of the day to Middle Earth and Hobbiton to avoid the crowds. Arriving at The Shires Rest, we were met by our guides and boarded the bus that would drive us into Hobbiton. This is the film set built for the Lord of the Rings and The Hobbit movies, now converted to a tourist attraction. The Wikato area and Alexander Farm had been surveyed from the air by a team looking for a place with a lake, trees and hills that fitted Tolkien’s description. Back on the ground they called at the farm, apparently at half time in a televised rugby match. That was fortuitous because the farmer would not have answered the door if the match had been in full swing! He told the visitors that they could explore the farm as long as they kept the gates shut and didn’t mix up his sheep – he was going back to the TV! So Hobbiton was discovered but needed to be kept a secret. The Army was drafted in to build the necessary roads into the area for all the filming equipment etc. to be shipped in. They were sworn to secrecy and the operation was supposed to be a “training exercise” but, unfortunately, someone let the cat out of the bag in a local bar after a few drinks. The set was built, well used and then dismantled. 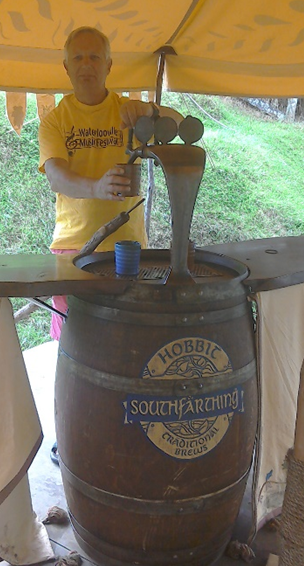 Fortunately the farmer’s family saw the potential, and with Peter Jackson’s involvement, the whole thing was rebuilt in a more permanent form for the filming of The Hobbit so that we can all enjoy it. A team of gardeners keep the grounds in good order and The Green Dragon Inn serves ale and cider to visitors. It is also available for weddings and corporate events and at the time of our visit Smaug (the dragon) could be seen at the edge of the lake, poking his head out ready to breathe fire for a P&O party. The whole area is lovely with lots of little details making it come alive. Lots of Hobbit holes of various sizes were created to allow for various angles of filming, the paths allow for a continuous flow of visitors at half hourly intervals (hence the need to be early so you can photograph the place without crowds) and at the end you get a free drink at the Green Dragon Inn – but no smoke ring competitions! Tearing ourselves back to reality we hit the road, heading north toward Tauranga, the largest city on the western Bay of Plenty and an important commercial centre and port. Here we passed St George’s Anglican Church. Sadly it was on the other side of a dual carriageway in a rush hour so we couldn’t visit – next time! The church is built on the site of an ancient Maori Pa where a battle during the land wars was fought with the British in 1864. The Battle of Pukehinahina was very fierce and has become notable for the act of chivalry by one of the defenders, Heni Te Kiri Karamu, who risked her own life to give water to a dying British officer and other wounded men. The first church was built in 1900 as a memorial to the battle. A couple of fires in the 80s and 90s eventually destroyed the building and the present building was started in 1993 with a stained glass window depicting Heni Te Kiri Karamu. We had our lunch on the seafront away from the busy traffic in town, which seemed a bit hectic after miles of quiet country roads. There was a cruise ship in port and we could see Mount Maunganui, an old volcano, at the mouth of the harbour. 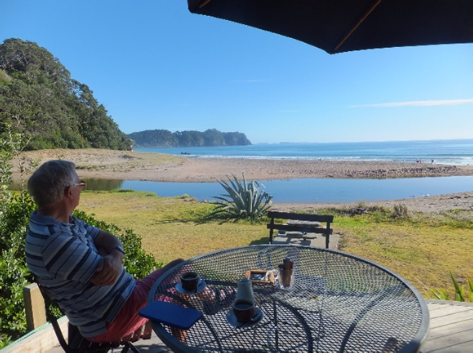 We continued northward up the coast, heading for the Coromandel Peninsula. Katikati displayed its various murals through the town and we travelled through fruit farms where avocados are the speciality - and still more forestry. Hahei was our destination and we were pleased to find the camp site right on the beach. At 5pm we had the sands to ourselves apart from a family playing cricket. Swimming in the sea was a must. Looking at the various things on offer in the area we decided that the best way to appreciate them all was to take a boat trip so a call to Scott secured us places on the trip the following afternoon. The next morning we drove round to Whitianga and explored the shops. Scones and coffee outside a café brought an audience of sparrows eager for crumbs – better than the seagulls raiding the tables down by the harbour. We took the ferry across the harbour to Ferry Landing. The stone wharf was made of huge, hand cut stones and served the boat building yards and timber works. The deep water harbour made it an ideal port and the timber was used by the British Admiralty for their ships. Here we found various signs – including one that instructed you to move up the hill, above the white line on the map, in the event of a Tsunami! The cemetery had various reminders of the early settlers trials and tribulations. So many children died so young in the 1800s. At 1.30 we boarded the Ocean Leopard and sped out into Mercury Bay. Scott was an excellent guide and explained the geography and history of the coast as we sped back towards Hahei, passing yet another of Captain Cook’s landing places. The cliffs and islands display a variety of features of the geology and eroded rocks and the waters are rich with marine life as it is a Marine Reserve. 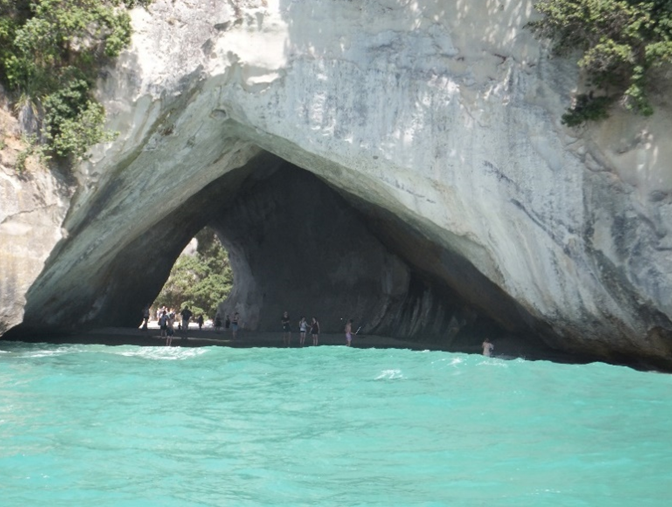 Cathedral Cove is a spectacular natural arch which has been created by the waves. It is only accessible by kayak or on foot as it is 1km away from the nearest car park in Hahei. It is also famous for its starring role in Narnia and Prince Caspian films. As we headed back to Whitianga there was a chance to explore under water with a snorkel. A handful of fish treats brought the residents to the surface and Colin and another chap from the boat jumped in to join them. I stayed on board as we got quite wet enough in the spray as we sped through the waves. Back on shore we had smoothies and Croconuts (a cross between croissant and doughnut) before driving back to the camp site. Again we had the beach to ourselves and swam with a beautiful rainbow over the headland. We made an early start the next morning as we had to hit Hot Water beach at low tide. Here there is a small stretch of beach where hot water seeps up from below. 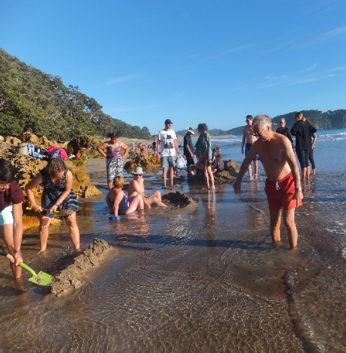 You can hire spades to dig a hole to create your own spa pool but just wiggling your feet into the soft sand will make you hop out of water that is a bit too hot. Having got going early we treated ourselves to breakfast at Hotties, the beach side café. A beautiful spot to enjoy a cooked breakfast – if you were quick. The chap next to us got up to fetch some ketchup and a seagull swooped down and pinched a mushroom off his plate!! Then it was time to hit the road again and travel up round the peninsula, across to Coromandel itself where a large number of motorcyclists were congregated for a lunch break on their day out. Driving down the coast to Thames we found lots of people out with their boats, making the most of their weekend.